1 D. L. Goodstein, R. P. Feynman, J. R. Goodstein, Feynman's Lost Lecture: the Motion of Planets Around the Sun, Vintage, London, 1997, p. 52. 2 Snicket, L. When Did You See Her Last?, Little, Brown and Company, NY, USA, 2013, p. 120. 3 Extracted from the artist's statement for Bibliouroboros. 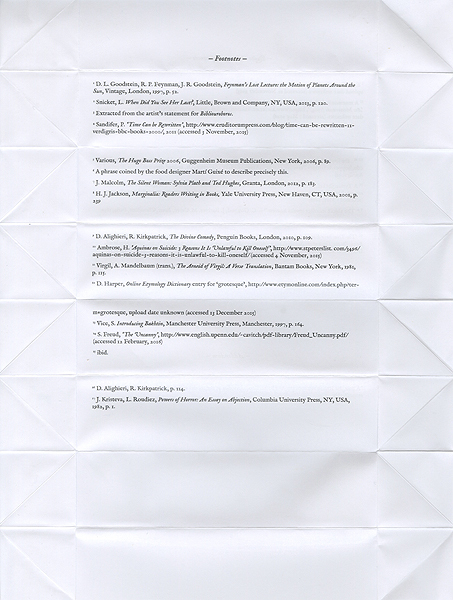 5 Various, The Hugo Boss Prize 2006, Guggenheim Museum Publications, New York, 2006, p. 89. 6 A phrase coined by the food designer Martí Guixé to describe precisely this. 7 J. Malcolm, The Silent Woman: Sylvia Plath and Ted Hughes, Granta, London, 2012, p. 183.